When did well-done steak become de rigueur? You can’t really mess that up, just cook until nearly burnt. This week I was chosen as part of a 2-person team to cook the steak for the entire class, and I NAILED it. I was sooo thrilled. Now I just have to figure out how to re-create it. Go to blog postWho cooked this steak? I've had a busy summer this year and although it's not over yet, I thought I'd share some of the things that I've done. I've done a LOT of cooking this summer so I've pulled together this pictoral essay of some of my favourites. Enjoy! Go to blog postSo what did you do this summer? I love pork but class last night was really tough because we prepared a suckling pig, and I just wasn't prepared for how small the pig was. It was the first time in all my years of cooking that I was seriously turned off of eating and cooking meat and it largely because of this guy. Go to blog postA crisis of conscience? A spicy and sweet jam that goes well with a nice, sharp cheese, and it's really great with grilled cheese. 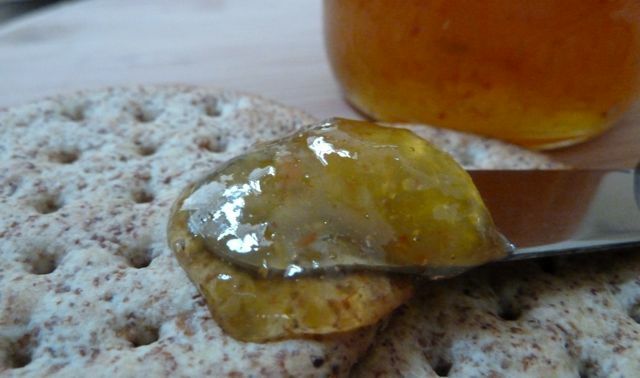 Although the recipe involves hot peppers, the end result is a jam that is actually very flavourful and not that hot. If you want to increase the heat intensity, leave the seeds in when you prepare it.